Access and control your locks from anywhere at any time using your smartphone, tablet, or computer. Easily let a friend in when you’re away or let yourself in if the key has been misplaced. You can even check on the status of the locks to make sure your home is secure at all times. Create unique user codes for visitors so you can know who specifically unlocked the door and have the option to limit their access. You can set rules to enable certain user codes to work only during specified periods – so the dog walker’s code will only work during weekdays between 12pm and 1pm – and you can disable the code at any time. Receive a text or email alert when the door is unlocked to know when the kids get home from school or when the technician arrived for a service appointment. These real-time notifications keep you informed of who is in your home when you’re not there. Monitoring your door locks gives you complete awareness of who is entering and exiting your home every day. Know when your family gets home, when the renters arrived to your vacation home, and easily make sure the house is locked when you need it to be. 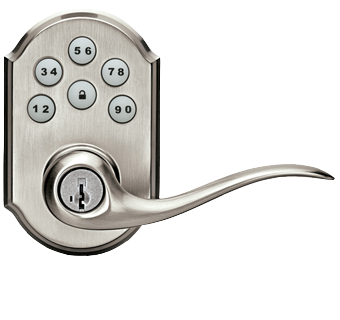 All locks are available in Nickel, Brass, and Bronze finishes.